Did the Bismarck Try to Surrender? This spectacular book tells the story of submarine warfare across the centuries, including the bitter struggles of WW1 and WW2 during which the fates of nations were settled by events at sea. 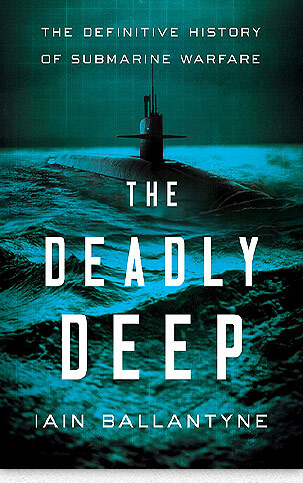 The action-packed narrative of ‘The Deadly Deep’ includes Hitler’s U-boats against convoys in the Atlantic, the US Navy’s submarines seeking to bring down the empire of Japan and Britain’s submariners undercutting Rommel’s Afrika Korps. 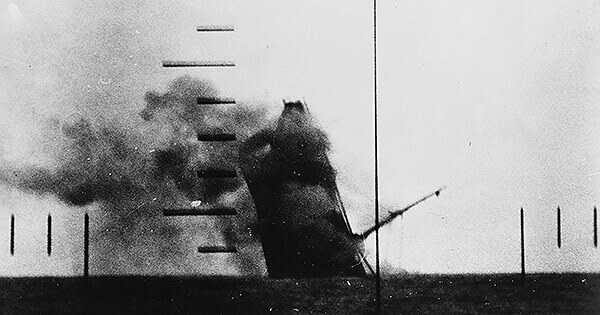 A Japanese cargo ship sinking in the Yellow Sea, March 1943, a periscope photograph, taken from USS Wahoo which had just torpedoed her. Photo: USN/US National Archives. The epic narrative delves into the post-Cold War era too. It concludes with a look at the East-West balance of terror between the 1940s and 1990s, the story of submarines in wars against Saddam and Colonel Gaddafi, plus how President Vladimir Putin is wielding his navy during missile boat diplomacy as a new Russia versus NATO contest gets underway. It all adds up to a fascinating and comprehensive account of how an initially ineffectual underwater craft – originally derided and loathed in equal measure – evolved into the most powerful and terrifying vessel ever invented, with enough destructive power to end all life on Earth. PCU Indiana on Alpha sea trials. Photo: US Navy, courtesy General Dynamics Electric Boat. The key role played by Americans in the risky early days developing underwater fighting vessels is told: from the exploits of David Bushnell’s Turtle (attempting to break the British grip on rebellious North America); through Robert Fulton and his Nautilus (devised for Napoleon Bonaparte); the ill-fated adventures of craft and their (often unfortunate) crews during the American Civil War; John Philip Holland’s groundbreaking vessel (originally devised for the cause of Irish liberation but first pressed into service by the US Navy). The world’s first major submarine war is covered, showing how deadlock in the trenches on the Western Front during WW1 saw gambits by both sides to use submarines as a means to break the stalemate. We learn how the Kaiser’s U-boats offered Germany its best chance of victory, but ultimately their activities were in vain, with their actions bringing a million American troops into the war on the Allied side. 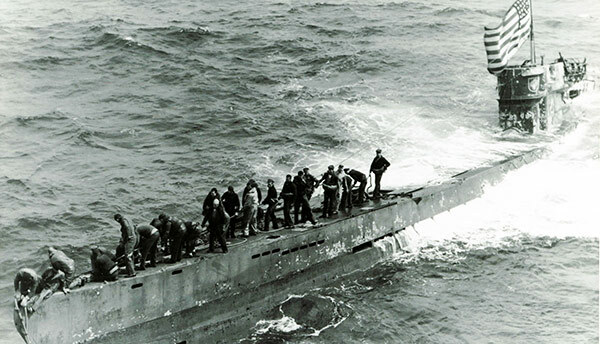 A US Navy boarding party secures a tow line to the newly captured German U-boat U-505 on June 4, 1944. Photo: US Navy. Among the other fascinating episodes is: a scheme devised by notorious SS officer Otto Skorzeny to fire submarine-launched cruise missiles at New York in the dying days of WW2; a dangerous contest between an American submarine and a Soviet boat in the North Atlantic in the 1950s; a British submarine’s hunting of a ex-US Navy cruiser that survived the Pearl Harbor attack but which in the early 1980s (rechristened General Belgrano) met a cruel fate off the Falkland Islands. At the heart of this thrilling narrative lurks danger and power as we discover some of warfare’s murkiest secrets, meeting submarine captains of various nations. Some are charismatic and courageous while a few are devious and cowardly. 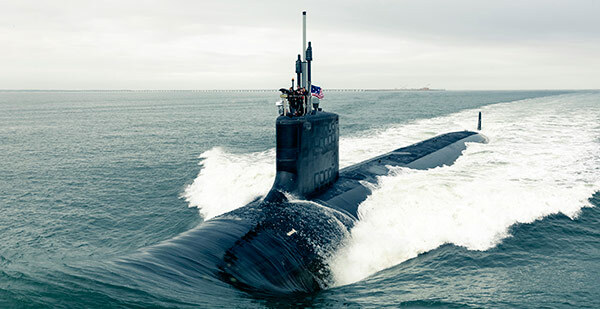 The role of cutting edge technology in providing victory is scrutinized while the enduring relevance of submarines in deciding the fate of us all is starkly presented. Also available in from 22 January 2019 as an audiobook (Dreamscape Media; Unabridged edition/USA only) Narrated by Paul Ansdell. Material on this website protected by copyright.